The three, who were found dead in the back of a truck, were part of a protection team for Cancun’s mayor. Authorities say they think the men were intercepted on a road near Cancun, then taken to a remote forest, tortured, and killed with a shot to the head. Drug-related violence claimed more than 5,000 lives in Mexico last year. Brig Gen Mauro Enrique Tello had only just become a security consultant, having retired from the army on 1 January. identity of the victims points to a contract killing by a drug cartel, the BBC’s Stephen Gibbs reports from Mexico City. The Mexican government, which depends on tourism income, will be determined to ensure that this is an isolated case, he says. Drug-related violence in Mexico is soaring, as criminal gangs fight both each other and federal forces as they battle to control the immensely lucrative routes trafficking cocaine and other drugs from Colombia to the US. But most of the violence has been to date been concentrated in Mexico’s Northern border cities. Cancun, which attracts millions of tourists every year, has largely been spared. President Felipe Calderon has vowed to destroy the cartels that make billions of dollars trafficking cocaine and other drugs to the United States. The general didn’t get much time. After a long, controversial career, Brig. Gen. Mauro Enrique Tello Quiñones retired from active duty last month and moved to this Caribbean playground to work for the Cancun mayor and fight the drug cartels that have penetrated much of Mexican society. He lasted a week. Tello, 63, along with his bodyguard and a driver, were kidnapped in downtown Cancun last Monday evening, taken to a hidden location, methodically tortured, then driven out to the jungle and shot in the head. Their bodies were found Tuesday in the cab of a pickup truck on the side of a highway leading out of town. An autopsy revealed that both the general’s arms and legs had been broken. 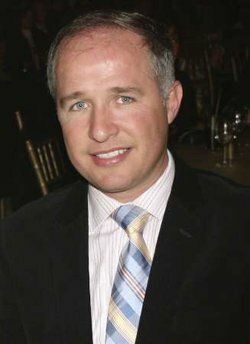 The audacious kidnapping and killing of one of the highest-ranking military officers in Mexico drew immediate expressions of outrage from the top echelons of the Mexican government, which pledged to continue the fight against organized crime that took the lives of more than 5,300 people last year. Military leaders, who are increasingly at the front lines of the war against the cartels, vowed not to let Tello’s death go unsolved or unpunished. MORELIA, Mexico (AP) – A small-town mayor and an aide were found stoned to death Monday in a drug-plagued western state, the fifth city leader to be slain in Mexico since mid-August. Michoacan state Attorney General Jesus Montejano said the bodies of Tancitaro Mayor Gustavo Sanchez and city adviser Rafael Equihua were discovered in a pickup truck abandoned on a dirt road near the city of Uruapan. Montejano’s spokesman, Jonathan Arredondo, said initially that the victims were hacked to death with a machete, but the attorney general said they were killed with stones. Arredondo said police were trying to determine a possible motive. Tancitaro, a town of 26,000 people, is in a region where soldiers have destroyed more than 20 meth labs in the last year and several police officers have been killed by suspected drug gang members. 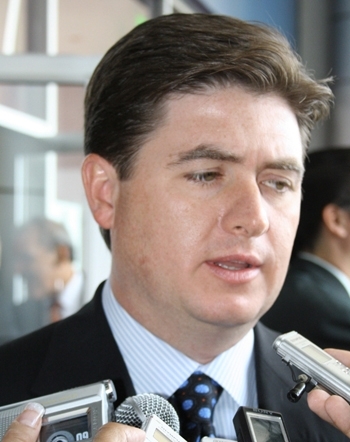 Last year the city council chief, Gonzalo Paz, was kidnapped, tortured and killed. Then in December, the mayor and seven other town officials resigned saying they had been threatened by drug traffickers and local police were not showing up to work. Soon after, the department’s entire 60-officer force was fired for failing to stop a series of killings and other crimes, and Michoacan state police and soldiers took over security in the town. Sanchez was named mayor in January. Also Monday in Michoacan, five gunmen and a marine were killed in a shootout in Coahuayana on the Pacific coast, the navy said in a statement. A second marine was wounded, and authorities were searching for more gunmen. Coahuayana authorities canceled school and warned people to stay indoors. The navy said another gunbattle across the country in the Gulf coast state of Tamaulipas left eight gunmen and one marine dead in the border city of Reynosa. Meanwhile, the Defense Department said soldiers arrested a man suspected in the kidnapping and killing of the mayor of Santiago in the border state of Nuevo Leon. It said in a statement that Miguel Cervantes was arrested Monday. In the border state of Chihuahua, gunmen broke into a police complex, subdued the guards and stole at least 40 automatic rifles and 23 handguns, police spokesman Fidel Banuelos said. Banuelos said 10 officers who were in the building at the time were being questioned. He said it was not clear whether the assailants were members of a drug cartel. In Ciudad Juarez, a border city in Chihuahua, the Public Safety Department announced the capture of a drug gang member who allegedly helped set up a car bomb that killed three people. Suspect Jose Contreras allegedly killed a man and dressed him in a police uniform to lure federal agents to the area where the car bomb exploded, killing a federal police officer and a doctor who was helping the shooting victim. Contreras is a member of La Linea gang, which works for the Juarez drug cartel, the department said in a statement. Ciudad Juarez, across the border from El Paso, Texas, has become one of the world’s most dangerous cities amid a turf war between the Sinaloa and Juarez cartels. MONTERREY, Mexico – Gunmen killed a town mayor near the drug-plagued industrial city of Monterrey, authorities said Friday, the fourth mayor in northern Mexico to be murdered in little more than a month. Prisciliano Rodriguez Salinas was gunned down late Thursday along with one of his personal employees in the town of Doctor Gonzalez, about 30 miles (50 kilometers) east of Monterrey, the Nuevo Leon state Attorney General’s Office said. Eliseo Lopez Riojas was killed as he was picking up equipment from the mayor’s house, and a white car waiting outside started firing. Investigators found 19 shells from two different weapons at the scene. Drug gangs warring for territory and smuggling routes in northern Mexico have increasingly targeted political figures in the region, though the attorney general said there were aspects of the crime uncharacteristic of gangs. Garza Y Garza said he was unaware of any threats against the mayor. Two police officers had been taken in for questioning about the killings, though Garza y Garza said they were not under arrest. In a short press conference Friday, Nuevo Leon Gov. Rodrigo Medina said soldiers stationed in his state had achieved some successes combating organized crime. “We will not give up this fight,” Medina said. 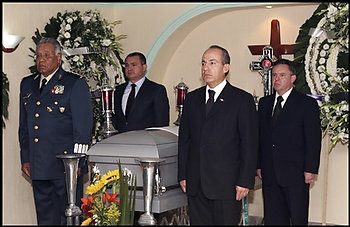 President Felipe Calderon condemned the attack and sent his condolences to the family as his government reiterated its commitment to the security of all Mexicans. The government has attributed the spike in violence in the border states of Nuevo Leon and Tamaulipas to a breakup between the Gulf Cartel and the Zetas. 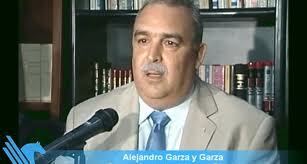 Monterrey-area mayor Edelmiro Cavazos was kidnapped in August and his body dumped three days later. Seven police officers who authorities said were paid monthly salaries by the Zetas gang were arrested in connection with that killing. It was followed two weeks later by a fatal attack on Mayor Marco Antonio Leal Garcia in Hidalgo, a town in violence-plagued Tamaulipas. Hooded gunmen shot to death Mayor Alexander Lopez Garcia in the town of El Naranjo in San Luis Potosi state on Sept. 8. The methods used in all three slayings were similar to those used by Mexico’s drug cartels. In June, gunmen killed the leading gubernatorial candidate in Tamaulipas state. 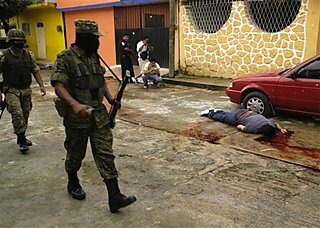 More than 28,000 people have been killed by drug-related violence since Calderon launched his attack on drug cartels in late 2006. Despite the unanimous demand of citizen leaders urging the Governor of Nuevo Leon to act after Wednesday’s wave of narco violence left a record of 13 dead, six people kidnapped from two downtown hotels and 18 people injured, the State Government of Nuevo Leon recommended: Carry on, Go about with life as Normal. Perhaps he should have added: And try not getting shot while doing it. Mexican authorities say seven people were killed in a shootout between rival drug gangs in the Pacific resort city of Acapulco. Guerrero state investigative police director Fernando Monreal says gunmen used grenades and automatic rifles to attack a house in a residential area of Acapulco on Thursday. The state of Guerrero, where Acapulco is located, has become a drug cartel battleground. Authorities on Wednesday found the decapitated bodies of two men inside a car abandoned in the community of Kilometro 30, near Acapulco. 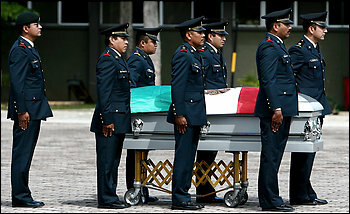 Nationwide, more than 28,000 people have died in drug violence since December 2006, when President Felipe Calderon launched a crackdown against drug traffickers.